Space shuttle Endeavour is seen poised to enter the Samuel Oschin Space Shuttle Display Pavilion at the California Science Center, Oct. 14, 2012. LOS ANGELES, Calif. — Space shuttle Endeavour has completed its final journey. Endeavour, which launched to space 25 times racking up more than 122 million miles (196 million kilometers), embarked Friday (Oct. 12) on "Mission 26," a three day, 12-mile (19-kilometer) road trip that took it over city streets from Los Angeles International Airport (LAX) to the California Science Center (CSC) for display. Endeavour, riding atop a modified NASA overland transporter and powered by four computer-controlled vehicles, exited LAX at 2 a.m. PDT (5 a.m. EDT; 0900 GMT) on Friday and arrived inside the CSC's new Samuel Oschin Space Shuttle Display Pavilion at about 9:45 p.m. on Sunday. "Nothing like this has ever been attempted before, and nothing like this will ever be attempted again," Los Angeles' mayor Antonio Villaraigosa said. "This was not just a once in a lifetime event, this was a once event." Space shuttle Endeavour rolls toward its new display pavilion at the California Science Center in Los Angeles in the final stretch of its three-day, 12-mile (19 km) "Mission 26" journey. On its way to the CSC, Endeavour was towed by a Toyota Tundra pickup truck as it crossed over the 405 freeway and was the inspiration for two public celebrations — including a dance number choreographed by "Fame" actress Debbie Allen. Endeavour's L.A. journey was witnessed by millions of spectators, who lined the roads, stood on rooftops and peered out windows to see the shuttle roll by. Mechanical issues with Endeavour's four transporters, as well as natural and utility obstacles along the route, slowed the "mother of all parades," resulting in the shuttle's delivery to the California Science Center being delayed a day. Space shuttle Endeavour is seen approaching the California Science Center at the end of its three-day, 12-mile (19 km) "Mission 26" road trip, Oct. 14, 2012. The CSC plans to open the Oschin pavilion to public visitors on Oct. 30. By 2017, the science center intends to mount Endeavour with a pair of rocket boosters and a replica external tank to recreate how the shuttle looked on the launch pad. The final journey of space shuttle Endeavour may have been its shortest mission, but it also was very likely its most documented. The spectators who came out were not just there to witness Endeavour's road trip, but also record it with just about every type of image recording device imaginable, from cell phone to Hollywood 3D camera. To capture this event, collectSPACE.com presents a photo gallery or more than 150 images showing Endeavour from the start to finish of its three-day, 12-mile "Mission 26." 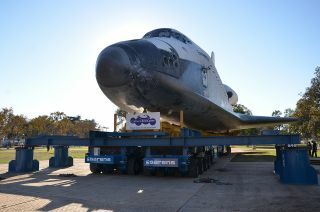 See shuttles.collectspace.com for coverage of the delivery and display of NASA's space shuttles.